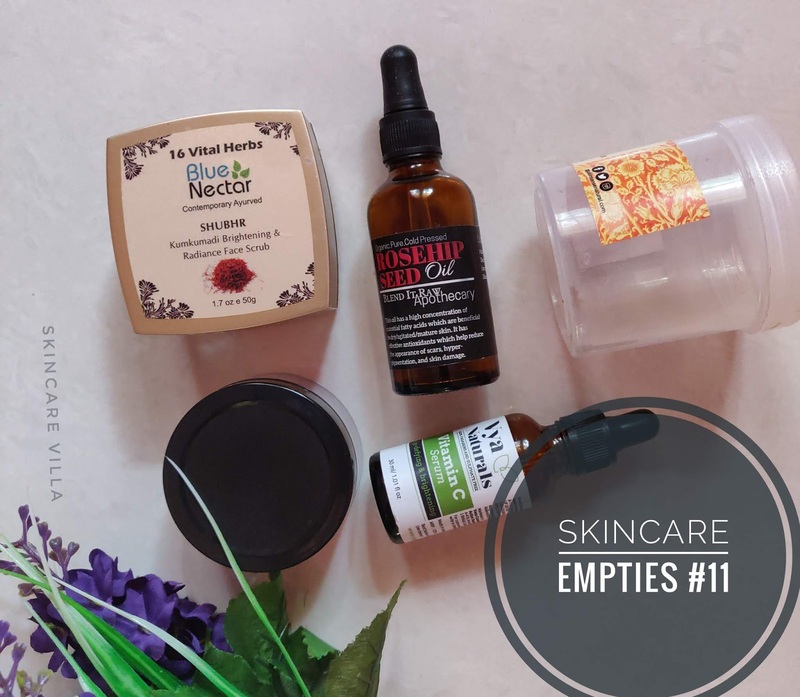 I am back with another empties post. I had been longing to reduce the number of skincare products I have in my drawer and there is no greater joy than to empty products and see what works for you and what all you need. From past two months I have been following a pretty simple routine, which has not only made my skin clear but also made me realize how I hoard and not use some products which I receive or which I buy. Let's head straight to the post and see what all has worked and what all hasn't. I am all heart for this Cleanser. It is so so good for acne prone skin and makes the skin so soft and smooth. I have a detailed review on this so will like to keep it short here. I have used this oil for straight 3 months or so only to find that it doesn't work on acne scars at all. In am attempt to empty the product I ended up using it on my hair. The product does give a nice glow to the skin when used as an overnight treatment. I highly recommend Moolit Beauty Rosehip Oil if you are looking to fade away your acne scars and definitely not this one. I love this scrub a lot. After using this scrub skin is left with a subtle glow and intense moisturization, I skip moisturising my skin after using this scrub. You can read the detailed review posted on blog. As stated above I have been following minimalistic skincare routine from past two months and the star product of it has been Kaira Naturals Aloe Vera Gel with 10% Hyralounic Acid. It has helped me fade my acne scars along with Moolit Beauty Rosehip Oil. I have already stocked up on another jar. Need I day more? I have used this serum on and off since receiving and finally emptied. How tough it is to empty a 30 ml quantity and we crib for less quantity for the price we pay. But Vitamin C Serums should be used within 6 months of opening and just did the same. A good serum of Vitamin C if you are looking for an Indian brand. Details already posted. So this is what all I emptied in past few months and am already using many products which will get over soon. Next empties post sooner than expected. Have a great day ahead. Can I get rhinoplasty to make my nose larger?